The NPD Group have released their full North American sales data for October, and, like every month so far in 2018, sales were up year-on-year. Consumers spent $1.5 billion on games and hardware, up a hearty 73 percent from $894 million last year. 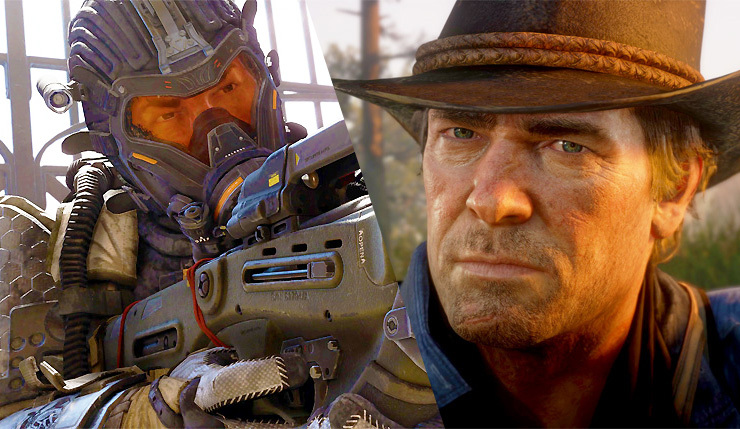 That’s not a huge shock, as the month saw the release of both Call of Duty: Black Ops 4 and the long-awaited Red Dead Redemption 2, although where those two games fall on NPD’s monthly software chart is somewhat surprising. Despite all the hype, and tripling the launch sales of its predecessor, RDR2 came in second place, with Black Ops 4 nabbing the top spot. Of course, RDR2 was only on sale for six days in October, so it wasn’t entirely a fair fight. On the hardware front, the PS4 chalked up another win, achieving an all-time October sales record. NPD didn’t reveal where the Xbox One and Switch ranked in comparison to the PS4, but, overall, it was a good month for everybody, with hardware sales up 19 percent to $2.7 billion. Looking beyond Black Ops 4 and Red Dead Redemption 2, other October debuts include Assassin’s Creed Odyssey at #3, Super Mario Party at #5, and SoulCalibur VI at #6, which is a great result for a fighting game. On the more disappointing end of things, Forza Horizon 4 debuted out of the top-10 at #11, although you can probably partially chalk that up to people playing the game via Xbox Game Pass. So there you are – the results from the most competitive gaming month of the year! What are your thoughts? Did Black Ops 4 pulling off the win surprise you? Which game will be #1 for the full year when the dust settles?